Year after year prime rib continues to be one of the most sought after meat choices during the holiday season. Many are reluctant to tackle this expensive cut of meat due to its price and preconceived complexity. Chef Jack Carlisle lets us in on three of his best kept secrets to smoking the perfect prime rib. Fat is key and so is choosing your cut. Select (good) vs. Choice (better) vs. Prime (best.) Chef Jack recommends at least buying Choice. Chef Jack recommends not using table salt, but rather Kosher salt. Salting should be done evenly and thoroughly. Try salting your prime rib from about 12-inches above the meat. This will give you a well-distributed, even coat of salt. For best results go for the reverse sear. Chef Jack is using his Woodwind SG with Sidekick option. 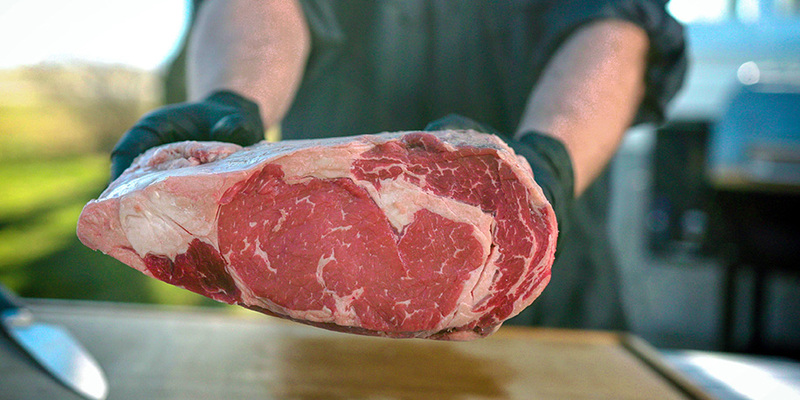 Fire up your Camp Chef to 225°F and wait for the prime rib to reach an internal temperature of 100°F. Next, crank your grill up to 500°F, use the Slide & Grill capability, and let the flames do the talking. After a dark crust has formed and the prime rib has reached a safe internal temperature of between 130-160°F (depending on your liking,) take it off. Finally, let it rest for 20 minutes and then you’re ready to dive in. 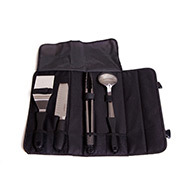 “The beauty of Camp Chef is that you can create your own style. 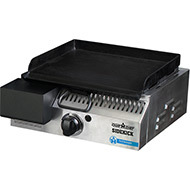 You can use the Sear Box, Sidekick, or simply cast iron.” – Chef Jack Carlisle. We couldn’t agree more, Chef. For prime rib recipes click here. What success stories have you had preparing prime rib on your Camp Chef? Let us know in the comment section below. I’m trying this! Looks great! One question, I was told not to go above 350 degrees with the blanket on or the magnets would fail. So when I crank it up to 500 it will ruin my blanket magnets? Woohoo – great. Good luck! You are correct about the magnets. We suggest taking the blanket off during your high heat time. Looks great, but i like my meat cooked medium well inside how long do i leave it on & i don’t have a bbq now it’s winter i live in a condo so gotta use my oven. I have cast iron pan i can sear it on that then cook in the oven in the cast. Thanks for the tips i love to cook & love prime rib it’s my ultimate favorite! Won’t it be well done after sitting for 20 mins starting at 130-160 degrees? I’ve always taken mine off at 110 and cover it with hd foil and let it sit. Comes out a perfect med rare! 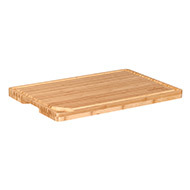 No, not all Camp Chef pellet grills have Slide & Grill Technology. Check on the product page under features to make sure. Chef Jack gets it done with enthusiam and skill. Couldn’t agree more, Gary! I’ll pass on the love to Jack. Chef, I’ve always gone (indoor oven, at least) with the 17 minutes/lb @ 350 degrees plan. I’ve always wondered how long per pound for cooking at lower temperatures. You don’t mention any time or weight in this recipe. Suggestions? While this is not a recipe, you will find that we do not like to limit our recipes to a specific time. We encourage regular tracking of your food on the pellet grill. Every cook, pellet grill, piece of meat, weather, etc. is different…there are many factors that go into cook times. There are a couple of prime rib recipes if you head over to our recipe blog. Is there a list or book that will let me know about how long it will take to cook, say a 10 or 15 pound prime rib. The book also says to cook until it reaches 130 to 160 degrees. My question, is 130 rare, 160 well done?? No, we do not have a chart on hand for prime rib cooks times. Chef Jack said that his best guess would be to set aside 3-4 hours to give yourself plenty of time. We often do not post an exact cook time amount because there are so many outside factors. Tracking plays a large roll in a successful cook. 130F is rare….160F is well done. 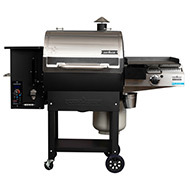 This is a great article on Slide & Grill Technology: https://www.campchef.com/blog/what-is-slide-grill-technology/ Unfortunately, your PG24 (SmokePro DLX) is not equipped with this. Approx how long does it take to get up to the initial internal temp of 100 degrees? It’s different for everyone and there are many outside factors. Chef Jack suggests actively tracking your cook, but in general a 10+ pound piece of meat can take between 3-4 hours. What kind of pellets does Chef Jack suggest for Prime Rib? Chef Jack said he loves to pair his prime rib with Cherry or Charwood Cherry pellets. Best of luck! Buy single prime ribs and then stack them. 3 or 4 work stacked one on top of the other works out very good for us , but you can stack as manny as you like, Cooks the same as one big prime rib and no special ordering. Jusp salt and season the whole stack. Guess what, their already cut up for single portions! Thanks for sharing! Love hearing your success stories. Please don’t take w prime rib roast above 140. That is medium. Any higher and you might as well buy Chuck instead. Just my opinion. When I do a PR roast I use 6 probes and do it at 225 until the outer part approached 120. The I turn it down to low smoke until the middle fatchs up. I have found the sear box to be too hot, even at it’s lowest setting. Mine causes the roast to flame up, not just sear.. I pull the roast off and turn the grill to 400 and pull at 130 to 135;. Let rest 15 minutes before cutting. Allow about 35 min per pound for bone in, 30 min for boneless. Sounds like you’ve got it down, Don. Thanks for sharing your knowledge.